"So tasty that people were actually scraping their bowls!" Place white wine, peach schnapps, sugar, mint leaves, cinnamon, nutmeg, and half-and-half together in a bowl, and stir until well blended and sugar is dissolved. Add sliced peaches, and transfer to a saucepan. Cook over medium heat for 15 minutes, stirring frequently and reducing heat if necessary to prevent scorching cream. Remove from heat when peaches are tender. Cool to a safe temperature for blending. Process in a blender or food processor until completely smooth. Cover, and refrigerate until ready to serve. Serve chilled. 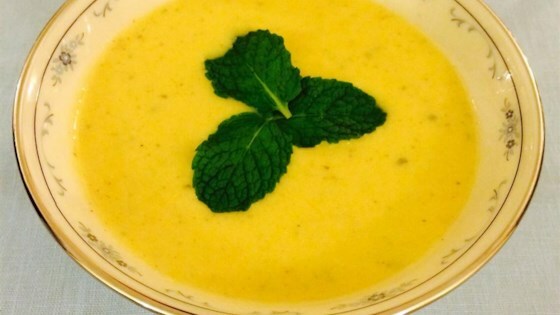 Fresh sweet corn featured in a refreshing soup! Super yummy. The Schnapps adds just the right peachy sweetness and the spices (cinnamon, nutmeg, and mint) made it taste like a peach cobbler soup. Thanks! Absolutely devine! Great recipe that is refreshing and delicious on a hot summer day. Cannot wait again. Kids liked it as well. WOW! Super delicious! Topped w/ vanilla yogurt like other reviewers stated. Served as dessert- Awesome, awesome, awesome.. Very good for a summer night. May need another fruit to round it out. Maybe mango. Yum! This was perfect for summer!